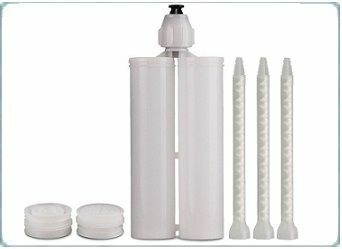 Air-powered syringe barrels for dispensing liquids, gels, resins and pastes. Industrial grade safe at pressures to 100 psi. Silicone-free plastics guaranteed not to contaminate sensitive adhesives. Available in sizes 3cc, 5cc, 10cc, 30cc and 55cc and clear, amber or black colour. Supplied with a wide range of accessories including pistons, end caps, tips caps, adapter assemblies, O-rings, etc. And a range of manual hand syringes. Dispensing tips luer lock for use with dispensing barrels and valves. Certified industrial grade safe and silicone-free. An extensive range of precision tips available from stock. Micro shot tips for precision applications. Smooth flow tips for high viscosity gels and pastes. Teflon tips for reactive adhesives such as Cyanoacrylates. Brush tips, bent tips, all metal tips, aluminium tips, flexible tips, short tips, long tips and more. Large volume cartridges suitable for use with almost all liquids, gels, resins and pastes. Industrial grade safe for use at air pressures to 100 psi. Silicone-free plastics guaranteed not to contaminate sensitive adhesives. Available in sizes 2.5oz to 32oz and in a selection of colours. 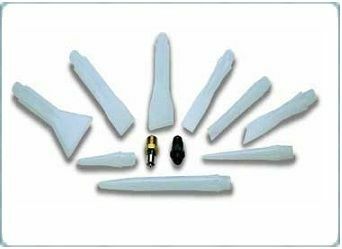 Wide range of accessories including plungers, end caps, tips caps, retainers, O-rings, etc. All cartridges feature a 1/4" NPT nozzle thread. Nozzles for use with cartridges and metering valves. All nozzles feature the 1/4" NPT thread. Standard nozzles with variations on outlet hole size. Small orifice for watery liquids or small deposits and larger outlets for thick pastes and larger shots. Select options for length and ID size. Also ribbon nozzles for spreading a wider, flatter band of adhesive. Select by nozzle slit width. Roller nozzles for even spread coverage of low viscosity fluids. Dual cartridges allow a two-part materials such as epoxies, resins, PUs, potting compounds and doming resins to be fed and mixed evenly without mess. Select from sizes 50ml, 200ml, 400ml or 600ml with mix ratio's of 1:1, 2:1, 4:1 or 10:1. For use with manual, air-powered or electric dispensing guns. For use with static mixer nozzles. Made from high density materials which are safe for use under pressure. Static mixer nozzles for use with 50ml/75ml dual cartridges, 200ml/400ml and 600ml dual cartridges as well as for high pressure metering and mixing machines. We stock most mixer types including bayonet style, bell mouth style and newer dual hole B and F system types. Select from nozzles designed for use with either 1:1 and 2:1 ratio or with 4:1 and 10:1 ratio dual component cartridges. Dispensing bottles with luer lock caps. 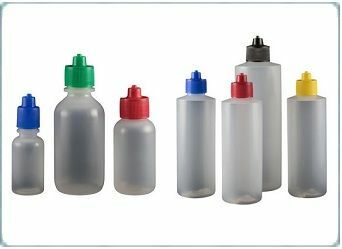 The cap allows the attachment of our dispensing tips for precision dots and beads of liquids, brushing of greases, primers and activators, potting products, henna inks, vaping fluid filling, etc. Low density soft plastics and high density semi-rigid plastics. Our bottles and caps are used by manufacturers, specialist markets, repair work, low volume, remote applications and for repackers. Dispensing bottles and pens with spring loaded nib caps. Acrylic nibs either chisel or bullet types. 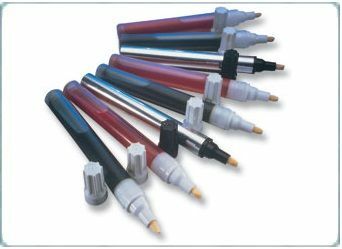 Plastic bodied versions for general material use or aluminium bodied pens & bottles for primers, solvent based liquids and specialist chemicals. Press the nib gently against a surface for liquid to flow. Release the nib and the flow stops. We also repackage these products with liquids specified by our customers such as 3M 94 primer, etc. Plastic and metal fittings for use with metering valves, cartridges, syringes and fluid lines. Luer lock, barb, compression type and threaded fittings. In polypropylene, nylon, brass and stainless steel. Fittings are industrial grade safe, silicone free and autoclavable. Supplied in sealed packs and we hold stocks of most items. Also included are liquid manifold fittings for use with fluid lines and valves. Fluid lines feed liquids, adhesives and solvent based fluids from a pressure pot, cartridge reservoir or syringe barrel to a dispensing valve or manifold. Made to withstand pressures without leaks. Fluid lines use luer lock twist-on/ twist-off connections for easy, fast connections. Available in clear tube or opaque black versions for UV cure adhesives. 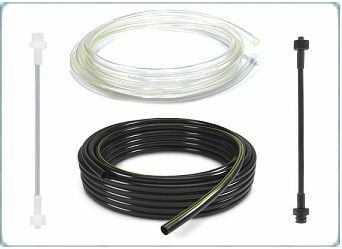 And feed tubing in clear, white or black in larger diameters for viscous materials. 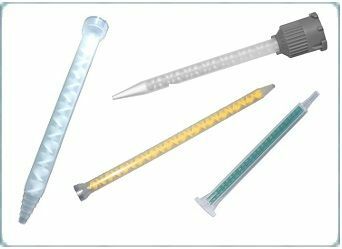 Our precision components provide safe and leak free fluid dispensing from syringe barrels, cartridges, bottles and pens. Industrial grade safe products for use with most adhesives, pastes and assembly fluids. Use manually or with a pneumatic benchtop dispensing system. Silicone free dispensing components including syringe barrels, tips, cartridges, nozzles, fittings, bottles and pens. Most items are available from stock and supplied in sealed packs. Each product group includes accessories and spares. For example, syringe barrels include pistons, adapter hoses, syringe caps, etc.